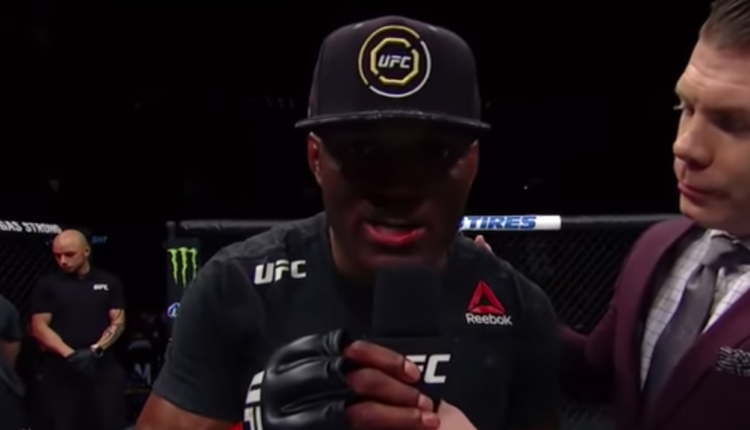 Kamaru Usman had a dream that he’d be win the UFC welterweight title as a replacement in a title fight, now that dream may come true as he is the potential replacement for Darrent Till in his fight against Tyron Woodley. On a recent edition of The MMA Hour, Usman told Luke Thomas that he would have been at the weight limit even if the UFC did not reach out to him. “It wasn’t really a selection process; I believe I was the rightful guy to be fighting for the belt in the first place,” said Usman. “I was already training before they announced the fight,” he continued. “I was already going to make weight regardless of whether they called of not. It was going to be in Dallas, my hometown — that’s my fight. That’s a perfect fight for me. Usman hopes that neither Woodley or Till end up being unable to make it to Dallas on September 1st, but he did have a dream that he would win the title on short notice. “If Darren Till is able to make weight, more power to him, I want him to be able to make weight and get his shot. And if everything is fine with Tyron, more power to him. But in my dreams I dreamt this was the process of how I become champion.